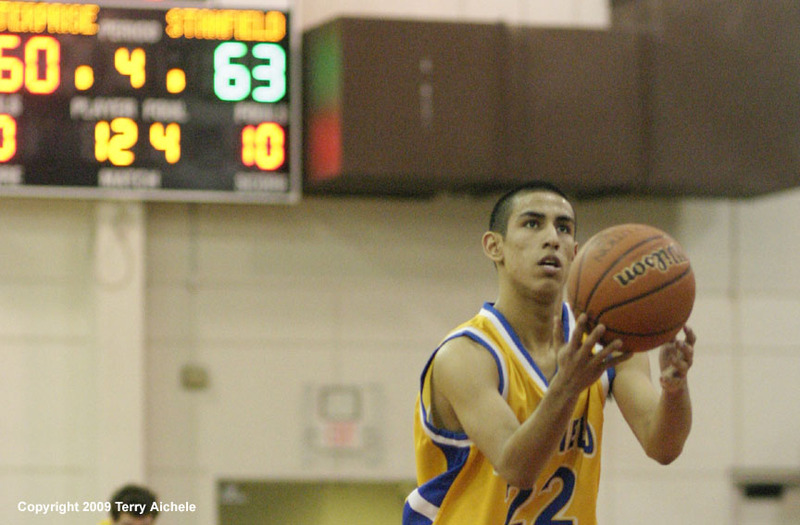 Hector Esquivel of Stanfield prepares to hit two freethrows with 24 seconds to go in overtime. PENDLETON - The Stanfield Tigers defeated the Enterprise Outlaws 65 to 60 in overtime at the Blue Mountain Conference tournament in Pendleton on Friday, February 20, 2009. It was a tough hard fought game with Enterprise leading at the end of the second and third periods. 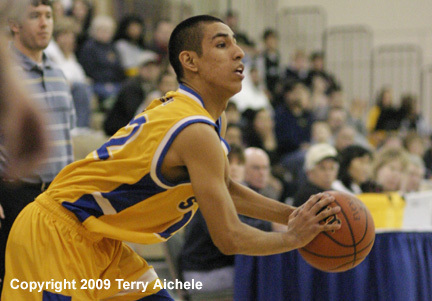 Stanfield led at the end of the first and at the end. Stanfield showed a coesiveness and teamwork that helped them down the stretch and in overtime. The first quarter was a back and forth affair. Enterprise scored first then Stanfield came back and took the 4-2 lead. Enterprise scrambled back to tie it at six and pull ahead by one, 7-6. They alternated leads until Devin Bailey and Tyler Hawkins hit treys to give the Tigers a 14-9 lead. Hawkins and Esquivel hit shots over the last couple of minutes to take a 20 to 15 lead at the end of the first period. Stanfield hit some cool shooting spots in the second period. They were stuck at 21 for nearly three minutes while Enterprise scored five to close to within one, 21-20. Stanfield's Robbie Shirley hit a two and a trey to give the Tigers a 26-22 lead at the 3:30 mark. 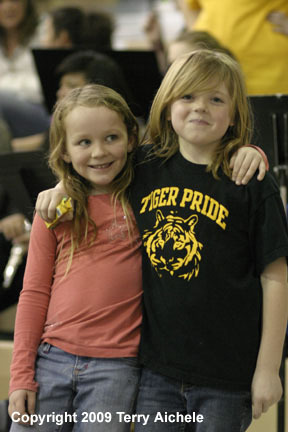 Then the Tigers went cold again for about four minutes which allowed the Outlaws to score 11 points. Among Outlaws scoring were Dakota Hull and Jared Micka. Hawkins his a trey at the end of the half but it wasn't enough as the Outlaws went into halftime leading 33 to 29. The Enterprise Outlaws continued to lead in the third. Enterprise had strong scoring by the big man Matt Fisher. Tigers scoring included Esquivel, Hawkins, and Shirley. Enterprise led at the end of the third 45-40. Enterprise continued to lead the Tigers through most of the fourth period. It wasn't until the two minute mark that Tyler Hawkins tied it up at 53 with a move along the baseline. The Outlaws Fisher scored at the one minute mark to take the 55-53 lead. Robbie Shirley of the Tigers was fouled and hit two freethrows to tie it at 55. 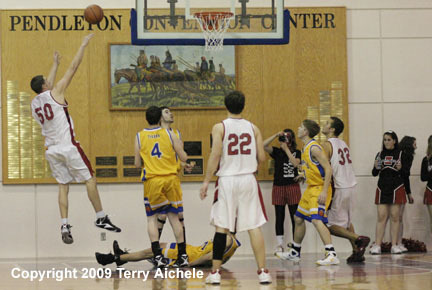 A foul sent the Outlaws' Fisher to the line whre he missed both with three seconds to play. The 55-55 tie meant the teams had a four minute overtime period to decide the winner. Matt Fisher of the Outlaws hit a short shot to take the 57-55 lead. Quinton Grogan of the Tigers then hit one of two from the line. Then Hawkins went to the line and hit two for the Tigers to give them a 58-57 lead. Trenton Neil of the Outlaws hit a freethrow to tie it up at 58. Tyler Warner and Dakota Hull of Enterprise each hit a freethrow to give the Outlaws at 60-58 lead. 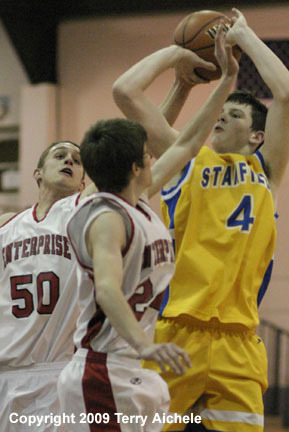 Stanfield's Chase Erwert worked the baseline for two tieing it at 60 with 2:22 to go in the overtime. Hawkins of the Tigers then hit a trey with 1:46 to go. Hector Esquivel went to the line after being fouled by Trenton Neil of the Outlaws and hit both freethrows locking up the win for the Tigers. LEFT - A couple of Stanfield fans just before the game. 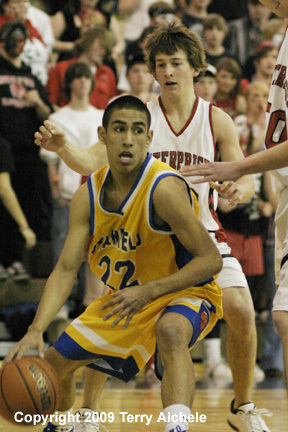 RIGHT - Hector Esquivel of Stanfield works his way along the baseline. 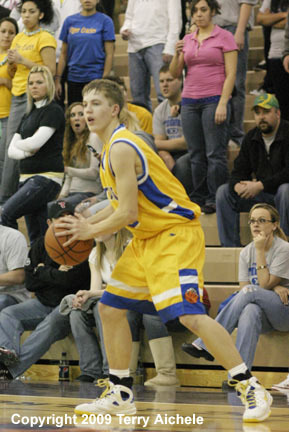 LEFT - Quinton Grogan of Stanfield takes a shot. 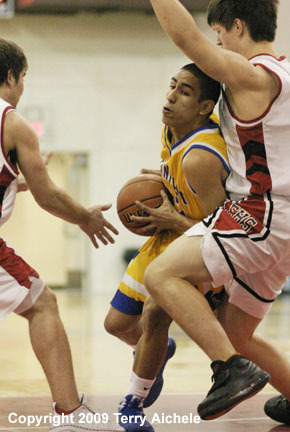 RIGHT - Omar Ibarra of Stanfield eyes the basket while being guarded by Jacob Girtz. 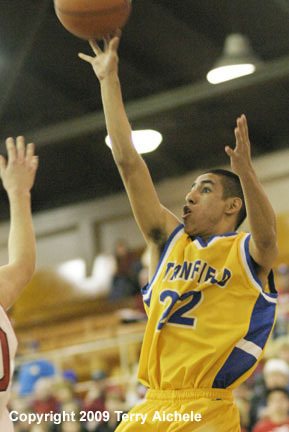 LEFT - Hector Esquivel of Stanfield lets fly with a shot. 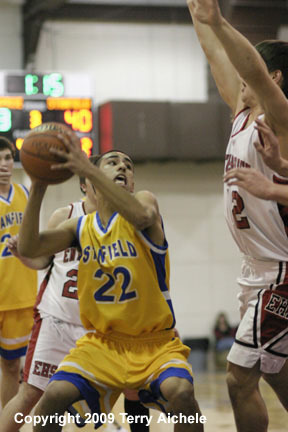 RIGHT - Hector Esquivel of Stanfield drives between two Enterprise defenders. 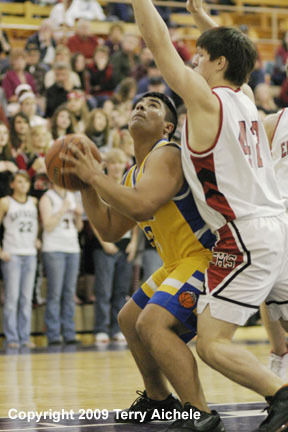 LEFT - Stanfield's Hector Esquivel looks for an opening to take a shot. RIGHT - Tyler Hawkins of the Tigers with the ball. LEFT - Enterprise's big man Matt Fisher takes a shot late in the game. RIGHT - Hector Esquivel of Stanfield prepares to take a shot late in the game.